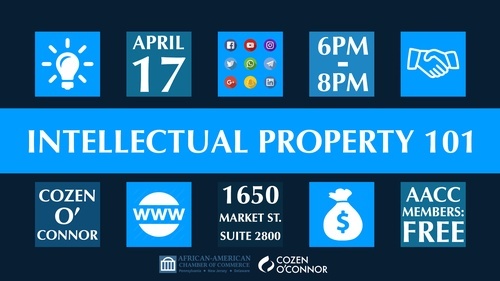 This event is sponsored by Cozen O' Connor and Chanel Lattimer will be leading the presentation. Chanel is a graduate of Princeton University and the University of Pennsylvania Law School. Her practice focuses on trademark and copyright prosecution, enforcement, and litigation; internet domain and social media infringement and cybersquatting issues; and intellectual property transactional matters, including licensing agreements.